Sarajevo’s cosmopolitan atmosphere harbors an intellectual flair in many of the popular tourist destinations. This city proves to be one of the most interesting in all of Europe, due to its location straddling East and West. Architecturally, the city is superb and fully recovered from past damage during the war, making it a strong European presence with a quirky Eastern atmosphere. 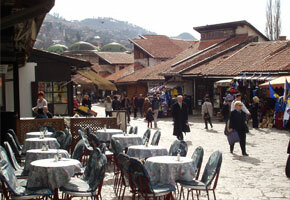 Go to Bascarsija Market for a taste of Old Sarajevo. Buy fresh fruit, vegetables, and a few goodies as you chat with the friendly locals. This market, twice damaged during the war, has regained its lively atmosphere once again. A trip to the Bascarsija Market ensures that visitors experience a real Old World market and the joviality of the Bosnian people. This mosque is one of the most important Islamic buildings found in Bosnia and Herzegovina. It was built in 1531 and can be seen from Sarajevo’s old square. The National Library was both the Town Hall and government building for the Austro-Hungarian Empire before it was used for its current purpose. During the war in 1992, it was set on fire. Not only the building, but the contents, were damaged, and to this day, restoration efforts are still taking place. A reminder of the Siege of Sarajevo, this bridge is referred to as the Romeo and Juliet Bridge after a couple tried to cross it during the height of conflict. While they did not cross safely, their deaths were used as a symbol of wartime suffering and injustice. Although a sad landmark, this bridge marks a significant point in Sarajevo’s past. The Sarajevo History Museum is one of the oldest in Bosnia and Herzegovina based on a western style. This complex series of houses spanning the grounds has turn-of-the-century flair and was built in the early 1900s. Discover their extensive archaeological section, which includes prehistorical artifacts, lovingly preserved. The Svrzo House is an interesting peek into the life of a Bosnian nobleman, or beg. Enjoy the architecture typical of the time, with an understated facade but a beautiful interior. View the rather strict separations of men’s and women’s (as well as business and family) quarters. For English language tour guides, it is recommended that you call ahead to schedule your visit. This museum allows tour groups to experience the tunnel that kept wartime Sarajevo alive. The tunnel, constructed in 1993, was used to supply food, fuel, and munitions to a city under siege. Today you can travel through the 25 meters of preserved tunnel to experience the resolve of the Bosnian people.